Video: Plug your Point-of-Sale System into your Website! Watch this Video to learn how our POS and Ecommerce integration enables seamless synchronization of Inventory and Orders between multiple sales channels. Feed POS Inventory to your website and send Web Orders to POS automatically. Integrate POS with Shopify, Magento, BigCommerce, WooCommerce, NopCommerce, Amazon, eBay, Farfetch, Fancy.com, etc. Send POS product catalog to e-commerce channels automatically. Automatically update online inventory every time an item is sold in POS. Automatically download web orders to POS. Watch this video to get familiar with 24Seven Channel platform. The video describes how two-way synchronization of data takes place between a POS system and multiple eCommerce stores. Basically, 24Seven Channel Manager is a cloud based platform, enables two-way data exchange between physical stores and Ecommerce channels. The Channel Manager platform is developed specifically for brick-and-mortar stores that need in-store point-of-sale (POS) to synch with Ecommerce platforms such as Magento, Shopify, Woocommerce, BigCommerce, Channel Advisor, Amazon, eBay, Farfetch, and Fancy.com. 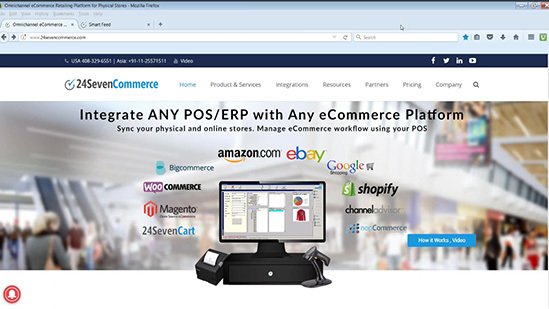 Eliminate duplicate data entry, send POS/ERP product data to all Ecommerce channels. Sync online and offline sales every few minutes. This 1.50 minute video describes how the leading point of sale (POS) systems integrate with the world’s top eCommerce shopping cart platforms. We sync your POS and website seamlessly. Retailers in over 20 countries rely on 24Seven’s integration services to enable selling on global marketplaces. 24Seven supports point of sale systems from the leading POS and Ecommerce platforms, including applications from Retail Pro, Microsoft, Tally, Keystroke, Amazon, eBay, Farfetch, Fancy.com, etc. The integration facilitates automatic updating prices, stocks and web orders along with other key information about your items between the two separate retail environments.